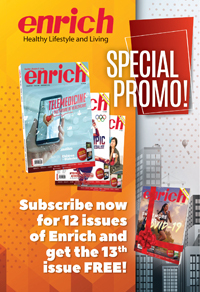 Browse the Enrich magazine APRIL 2019 ISSUE. With the latest regional business and general news and hottest trends in travel and lifestyle, combined with thoughtful and entertaining features from a stable of renowned foreign and local contributors, ENRICH serves to inform and entertain readers as well as act as a bridge between Mercury Drug stores and their customers. ENRICH is released monthly with a print-run of 30,000 copies and sold at over 1100 Mercury Drug stores nationwide which makes ENRICH the Philippines biggest and best circulating magazine. ENRICH informs its readers on the latest updates in the world of business and lifestyle, in addition to highlighting the synergy between Mercury Drug and its customers. With aspirational features covering topics from investment and health to lifestyle and culture, ENRICH is the custom magazine of choice for those wishing to keep in tune with what’s happening around the region.